Uganda’s largest protected area, Murchison Falls National Park is most acclaimed for it’s scenic beauty, plummeting waterfalls and high concentration of wildlife. Murchison Falls National Park is the largest national park in Uganda, and an ecological marvel for all of East Africa. The mighty Nile River flows through the park, and tourists (after travelling over the extremely long and bumpy road to the park) are greeted with a countless view of wild animal sightings, including hippos, elephants, crocodile, giraffe, baboons, warthogs, and others. The actual waterfall is breathtaking, the whole Nile river crashing through a mere 6-meter-wide crevasse in the mountainside. This park is a must-see for those travelling to Uganda. It’s possible to take a 2 hour launch trip from below the falls up towards the ravine. 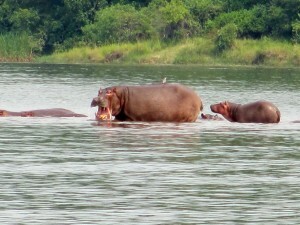 There are hordes of hippo and crocodile to see along the banks of the river. There are also several good lodges near the falls, situated in the middle of the National Park. I was amongst one of the many international visitors who visit the park regularly. In fact, I felt like following the footsteps of Winston Churchill while I was cycling, hiking and boat cruising in the park. I was also informed that Ernest Hemingway had also spent a considerable amount of time in Murchison Falls National Park, Uganda. It was a 5 hours ride to the Murchison Falls Park from Kampala by road. There was also a route to the park through the Budongo forest, but since I had plans of visiting the forest some other time so I chose not to opt for it. My stay in the park was truly memorable. There were lots of accommodation options available ranging from campsites to hotels, guest houses to lodges. I took a room in a guest house which was located right above the falls. The view was spectacular from there. Also, I was provided with a number of facilities which were eco-friendly. There are many attractions in the park to keep you entertained and never think of going back. For one, there is the miraculous water fall and the gushing waters of River Nile. Then there are hippos and crocodiles seen bathing in its waters or lounging along its banks. The riverbank wildlife is very rich and diverse and will definitely seize your attention if you are an animal lover. However, the most amazing part of Murchison Falls National Park is its boat cruise in the River Nile, the longest river of the world. A safari can be arranged by the River Nile which may include the Bungee jump as per your desire. I did not have enough time for the Safari but the Nile cruise was worth spending money on-totally exhilarating.